Hopefully there’s no easy answer — because everyone is so great. Let’s talk about your leasing team. Does each agent take point on a specific listing? Are other agents readily available to mop up any showing overflow? Or would you like a leasing team that works like that — effortlessly? That’s why we added the Primary Agent feature. Which agent is normally available to show each listing. When additional agents are automatically added because the primary agent does not have sufficient showtimes. Whether the listing is advertised with the primary agent’s contact information or the company’s contact information. How (and to whom) leads are assigned before the prospect schedules a showing. When enabled, you can select and change the primary agent on the Listings Page. Want to check it out now? Go to the Team Settings Page. ShowMojo’s one-size-fits-none mantra means there’s an extra setting for everyone. And we’ve updated Team Settings to make each feature more accessible than ever. Property managers or leasing agents who have exclusive and complete responsibility. An in-house team of cooperative leasing agents. Showing agents or other individuals who simply show the home. Leasing agents who act independently and show what they like. In any other manner that works best for your situation. ShowMojo’s multi-user features are there to fit the needs of your business. 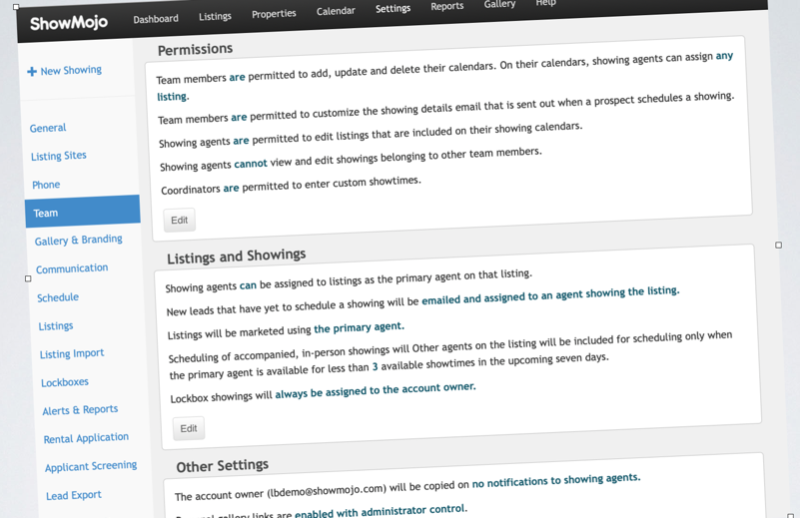 Team Settings allow ShowMojo to automate the leasing process for every kind of property management team. Our flexible, customizable team settings make ShowMojo’s scheduling process suitable and accessible for every team, no matter your individual needs. ShowMojo team settings allow you to have as much or as little control as you want over the way your team works, including how your team schedules their availability, who is assigned which leads, how much customizations your team members can include in their emails and more.